When I first wrote about ingegreating with Facebook I shared an example on how to share a post link and provide additional data like a picture to use as a thumbnail. This used to tell Facebook that the provided picture should be shown as the link preview, this no longer works. You can still submit the 'picture' property as a URL but it will be ignored. This behaviour is described in the Graph API version 2.10. Fortunately there is a way to control which image Facebook will use. First lets understand why this change has been made. Facebook had this to say about the topic. As part of our continuing efforts to stop the spread of misinformation and false news on our platform, earlier this year at F8 we announced an important change to our Graph API: Graph API version 2.9 includes a 90 day deprecation of the ability to edit previews attached to link posts. As Facebook said, the Open Graph meta tags are the currently supported way to modify link previews. Fortunately this is easy to add to a CMS or Blog system. It only took me a couple of hours to have a full end-to-end solution in my Blog's code working. The og:image tag is the one that is required, others are optional but I would recommend using them. This works the same way as back when the 'picture' property was supported with the API. Simply put the URL of the image into the content attribute and you're done. The image here needs to meet some guidelines e.g. it has be be less than 8Mb in size for Facebook to download it. The og:image:type tag specifies the MIME type of the image. The og:image:width and og:image:height provide the width and height of the image (in pixels) respectively. 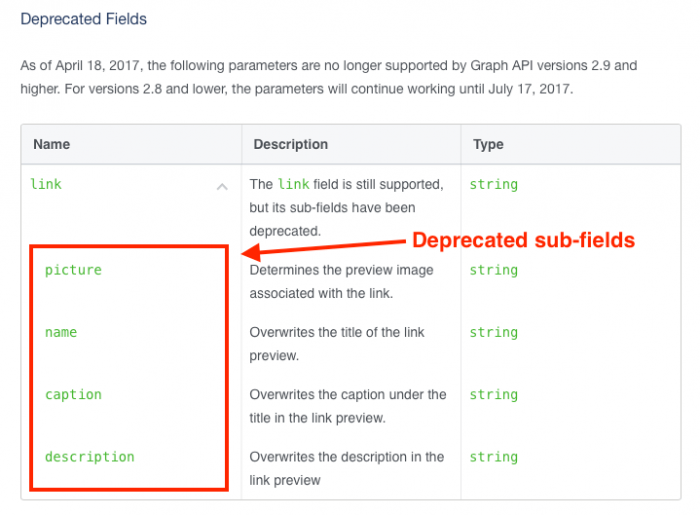 A PHP example on posting links is covered in Facebook's documentation here. Don't forget to use the URL Debugger after making your changes to ensure Facebook is behaving as you were expecting.